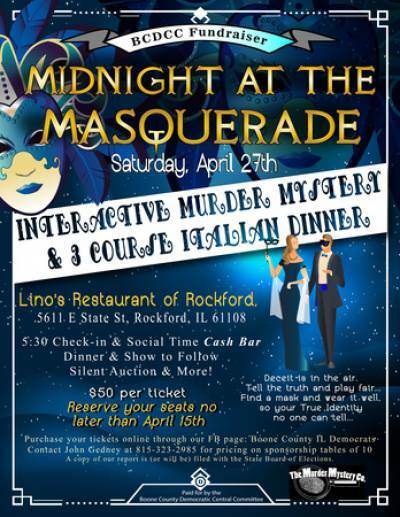 Lino's of Rockford, 5611 East State St. Ticket sales end April 15th. With a mystery under each feathery mask, unmasking the killer may be quite a challenge. It's up to you to determine which partygoer is guilty, bring this criminal to justice, and save the party! Attend the Masquerade Ball and trade clues with other guests, gathering information, and solving the crime before the masked menace gets away! Evening wear is casual, but there will be a best mask contest. 6:15 enjoy a scrumptious 3-course Italian meal as only Lino's can provide. During dessert our actors will prepare you for an evening of comedy & sleuthing. While hunting for clues, you may bid on unique autographed items, family day trips, and so much more! Each year, we share a portion of the proceeds with a local charity. This year #RSAC (Rockford Area Sexual Assault Counseling) will share in the evening's proceeds. A copy of our report is (or will be) filed with the State Board of Elections.